Word from TDEU: This was probably one of the hardest interviews to do so far, since it's hard to stay objective when it comes to Taylor Embree. His personality and passion to pursue his dreams and reach his goals are off limits, and we can definitely see why he was one of the most talked about NFL rookies, who unfortunately played with the Chargers only during the preseason. Enjoy! My grandpa played in the NFL, as well as my dad. My dad is now a football coach. As soon as I started playing flag football when I was 1st grade, I knew I loved football and I knew I wanted to pursue it. I always wanted to be an NFL player, but I didn't realize I might actually get a chance to play pro football until my sophomore year of high school. I never had any pressure from my family to pursue a football career. Basketball was one of my favorite sports. I was the one to put pressure on myself, since if I wanted to pursue a football career, I knew I wanted to compete, to be better than my dad and grandpa. When I first got to UCLA, it was a tough transition. Talent is so much better on that level, on top of that you got to go to class, you have practice every day, you got lifting every day.. It really is a job. The hardest thing for me was balancing school and football. When you first get there, no matter where you go, older guys play pranks on you. We actually had a rookie show, where all the rookies had to get in front of the team and do a skit, like sing a song, they had to dance, and so on. A group of us did a dance, I think we did the Soulja Boy dance. Then, I did a look-a-like skit, where I had a slideshow put together of pictures of guys on the team vs. cartoon characters or movie stars. Both in college and the NFL you have to earn your stripes. Just because you come in and you have a scholarship, you don't have the respect of your teammates. You have to show that you're there to compete, that you're there to win, they will pick on you, they'll be rough on you, but after a month or two, after you make some plays on the field - you gain the respect of your teammates. I was thrown in the ice tub, I had my clothes thrown in the showers. When I was rookie in the NFL, we had to bring in food for the older guys every morning, we had to carry their pads off the field. They're not going to hurt you or anything like that, you're just going to have to do some work and earn their respect. When you come to the team, older WRs are not really going to be your friends. They're not going to tell you all their secrets. At the end of the day, everyone wants to do the same - from building the program to winning as a team. When they see you can make plays on the field, they will help you. I played right away. 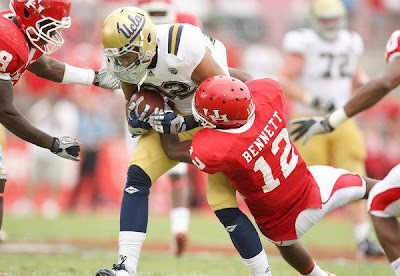 It was against Tennessee, we ended up winning in OT, and I had 5 catches that game. After that, I think I really earned the respect of the guys. QBs were spending the extra time helping me out, older receivers would help me on the sideline giving me tips and pointers. 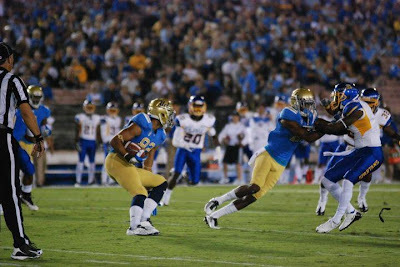 It's probably the wildest game I actually played at UCLA. Honestly, I didn't even think I was going to play, I didn't know how it's all going to work. Tennessee was ranked 21 in the nation, and it was my HC's first game as a head coach as well. We had 92,000 people at the game. When you walk out there - it's just overwhelming, it was an unreal experience. I didn't get in in the first 2 drives, I wasn't sure if I'm going to play that game. All of a sudden they threw me in and I caught a ball. I didn't even see the ball coming, it just hit my hands. Everything happened so fast. I worked out for some NFL teams. Then the draft comes. I started getting calls during the 5th round of the draft, teams were calling me saying they might draft me, and if not, they want to sign me free agent. 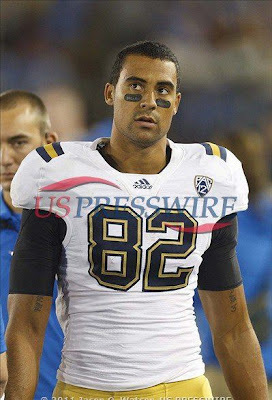 I signed as a free agent with the San Diego Chargers. 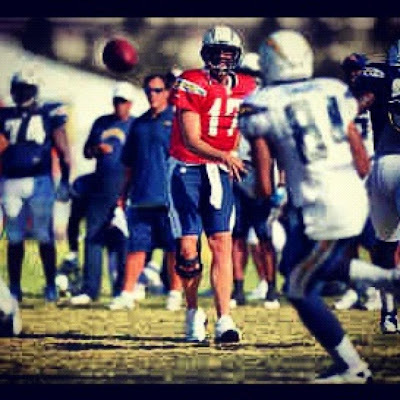 Within 4 days signing with the Chargers, I was already in San Diego working out with the team. The rookies do their own set of workouts over summer. You learn the playbook, meet the coaches. When fall camp starts, we start working with the veterans. I used to watch Chargers on TV, and Phillip Rivers is their QB. Now, when I was got to be in his huddle, I was like "Wow, this is Phillip Rivers! I'm in the huddle with Rivers and Antonio Gates!". You can't prepare for it. It's a dream come true. I caught a few passes from Rivers, and I was super nervous. Everything is going 1000 miles per hour, and some of the play calls we had were super long. It's a bloodbath. No one's job is guaranteed. Everyone is competing. Every drill, every move you do or make is to make it on the team. It has that feel. As a player you know that you got to beat the player across you because he's trying to take your spot. That's why I love college football. You're not getting payed. It's for the love of the game. In the NFL you can see it's business. There's a lot more loyalty in college, and in the NFL you got to look out for yourself at the end of the day. I thought I'd make it on the team since I had a really good pre-season. I had 5 catches, I was making plays. It comes down to being able to play multiple positions. I could only play WR, I never did anything on special teams. For me that transition - I wasn't able to do it and that was my downfall. As a WR, I definitely think I could make it in the NFL. At one point you realize a lot of good guys don't make it in the NFL. Only 1% of college players get a chance to stay in the NFL. At the end of the day I am grateful for the experience. 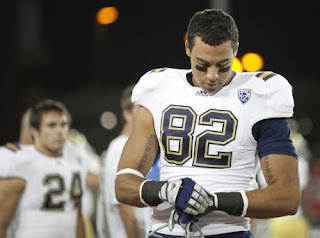 Football doesn't last forever, average career in the NFL lasts 3 years, and I'm not sure if I am willing to spend a year working and preparing myself for trying out for an NFL team in 2013. I am aware of the fact that it will set me back for a year, where I could have used the time to pursue a career outside football. With that being said, you have to figure out what you will do after football. However, if a team asked me to workout, I'd probably say yeah. I've heard about football in Europe from my uncle Sean Embree, who's now a head coach for Vukovi Belgrade, and also head coach of the Serbian national team. I've heard that football is really growing in EU and that EU has some really good athletes. I love teaching the game of football, I love working with kids. They're in it because they love the game. That's what's cool about Europe. People play it because they love it. That's why I'd love to have an opportunity to go out there and be able to teach the game of football. I know quite a few people that played overseas, especially from UCLA - Germany, Netherlands.. I've heard a lot of good things. Dropping the ball. Worst thing you can do in the NFL is drop the ball. Not blocking down the field for your running back. If the running back passes the front 7, and the receivers block, that's how you make a TD. WRs run all the time, and if it's a run play, a lot of receivers take the time off - and then the guy who they should block makes the tackle. It's a huge mistake. 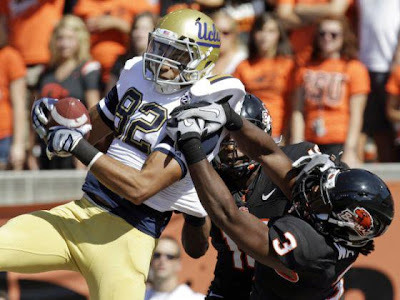 My favorite WR is Malcom Floyd. I had a chance to work with him and he's great. He doesn't get the national respect he deserves. He's an amazing athlete. Larry Fitzgerald. I feel he's one of the best WRs in the NFL right now. Now, the athletes I don't like. Tony Romo! He causes headaches for his team, he's selfish. He doesn't know how to make his team better. I might pursue a coaching career. But, first I want to pursue a business career - it might be music, or something else. I can always coach high school ball when I'm older. Surprisingly I have other interests besides football - I love music. I got into music because of football. Being on the team with 90 guys you hear a lot of music, and one thing I really like about music is that it's connecting people. We'd listen to a song before going on the field all hyped up. There's a really big connection in the States between athletics and music. There's a lot of athletes who want to be rappers, but not me. I'll try DJ-ing though. Right now I'm working with Mia Bajin and Avala DSF Music Group where I'm learning more about the music business and finding my niche there. Besides that, I have my own music blog, which is featured on TDEU as well, where I highlight one NFL player per week who shares his game day playlist. We had great kickers with the UCLA and Chargers. However, kickers don't do anything at practice. They get out on the field and if they miss - it's bad! They do get a bad treatment when they're rookies. And like I've said, kickers don't really do anything at practice. They practice maybe 20 minutes per day. "Enjoy the aspect of doing this for the love of the game! My best time playing football was in high school and college when it wasn't about the money. It was about going out there, playing the game you love. I know a lot of people say soccer is one of the best team sports. But, when you look at football - team going through play by play, parts of making a pass or run. Everyone has to do their job on time. I'm excited that football is picking up in Europe, because it is one of the greatest sports. Enjoy it! Enjoy that love for the game!"